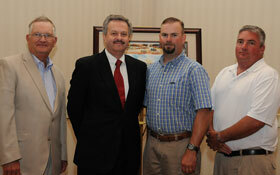 The Farm Press Peanut Profitability Awards were announced this morning. A winner is selected from each of the three main peanut producing regions. Pictured are (l-r) Richard Rentz, South Carolina, Greg Frey, Publisher, Farm Press, Rusty Strickland, Texas and Al Sudderth, Georgia. I spoke to each of the winners and asked them what the award means to them, what makes them profitable and how their crop looks now.